A small demo made for the NeoGeo Pocket monoc(h)rome console. this is a command line emulator so if that disturbs you there's probably some front-end to find somewhere (like https://sourceforge.net/projects/medguireborn/). Video may be coming or not. 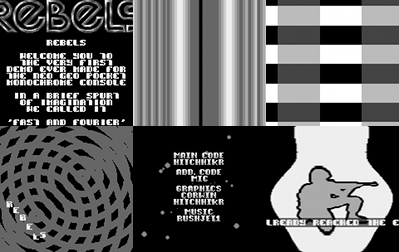 Afaik, this is the very first homebrew ever made specifically for the monochrome version of the pocket. A big, fat thumb up for this! Morden: i tried with NeoPop but the music went crazy. I checked it against your video, and it sounds pretty much the same, but for some reason, it's a bit faster in Neo Pop. It even displays this brief glitch with the text popping in for a moment in the upper portion of the screen, after the logo knocks it down. Just before it goes to raster bars. I didn't notice that bug in mednafen or in the consoles (both mono and color). rulez added on the 2017-10-10 07:24:30 by ɧ4ɾɗվ. Bug should be fixed and video updated (i had to watch the video step by step to actually see it :D). Smooth effects, smooth design. Very nice tune! page created in 0.013964 seconds with 15 queries.